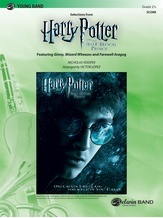 Three of the most memorable tunes from the sixth installment of the epic film series are included in this energy-packed medley. Beginning with the emotional "Ginny," the excitement is enhanced with "Wizard Wheezes." The medley concludes with "Farewell Aragog." Charming and charismatic film-score music carefully arranged for your young band.